Remote operated underwater vehicles, more commonly known as ROVs, are one of the most frequently used tools in shipwreck recovery. They are unmanned and maneuvered remotely, unlike submarines or submersibles. ROVs are connected to the ship via a neutrally buoyant tether or umbilical system. For very deep wrecks, the tether will need to be equipped with a tether management system, to help avoid tangles or an unwieldy ROV subject to changing currents. A good tether management system will lengthen and shorten the tether as the ROV pilot needs. Neutrally buoyant tethers will help minimize snags or tangles, but are virtually useless the deeper the ROV is exploring because of the changing water pressure and currents. In this case, an umbilical cable is necessary. Umbilical cables contains conductors for electrical impulses which are able to supply signals and power to the ROV. The umbilical cable will also power the hydraulic pump. Hydraulic pumps are used for propulsion and powering maneuverable arms and other tools. Even very small ROVs use these, though the power supply needed is usually minimal. Most ROVs have lights and basic video capabilities. As the vehicles get larger and more expensive, more tools can be added: sonar, magnetometers, still cameras, cutting arms, water sampling and testing abilities, light penetration, and magnetic bases, to name a few. There are several classes of ROVs: micro, mini, general, light workclass, heavy workclass, and trenching. Micro ROVs are very small (typically less than 7 pounds) and are usually sent into shallow places – pipelines, sewers or small cavities. 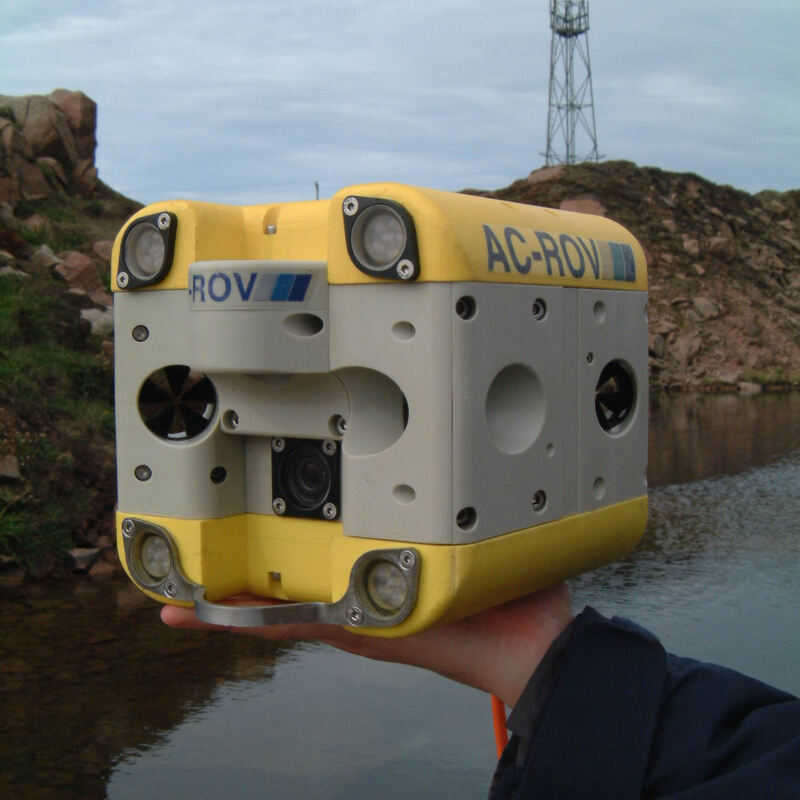 Mini ROVs are classified as around 30-35 pounds. These are good for checking out shallower ocean areas. Micro and mini ROVs are sometimes called “eyeballing” ROVs, since they are better for figuring out problems and not for actually fixing or interfering in them. General ROVs can travel up to 5 HP (a propulsion unit). They often are equipped with sonar and can be used on light surveying jobs. General sized ROVs can go up to about 3000 foot depths, though since they are smaller than workclass ROVs they may be subject to heavier currents. Light workclass ROVs have an HP of up to 50, and are often made of more durable materials than general ROVs – polymers instead of stainless steel or aluminum. They may have manipulators, and can travel to about 6000 feet below sea level. Again, as they are lighter, they may not be able to travel that deep without complications. Heavy workclass ROVs are generally equipped with multiple manipulators and have an HP of 220. They can withstand currents better than lighter workclass models, and can travel to depths of 10,000 feet without too much issue. 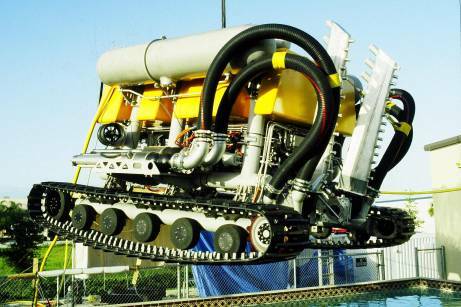 Trenching ROVs, also called burial ROVs, are made for very deep exploration. They can reach depths of nearly 20,000 feet and feature propulsion HP of up to 500. They are not usually necessary for most shipwreck recovery jobs. Oftentimes ROVs are housed in a “garage”, which is lowered into the water and then releases the ROV at a certain depth. This is the most common system used for deep recovery. Sometimes ROVs are used symbiotically, with a larger ROV making the more difficult journey down to the correct depth, and then a smaller ROV being launched from it into a smaller area (for instance, inside a wreck). This technique has been utilized in Sub Sea Research’s Port Nicholson recovery project. ROVs have been in use since the 1950s, when the Royal Navy created the first remote operated vehicle named Cutlet. This vehicle was used to recover practice torpedoes. The US Navy began using ROVs in their missions in the 1960s. Many famous shipwreck recovery projects have made use of ROVs – the Titanic, the Bismarck, the USS Yorktown, and the SS Central America are just a few. To this day, ROVs are used by the oil and gas industries, the military, and by scientists in many different projects. Many people use non-commercial ROVs for fun, as well. These ROVs typically do not go deeper than 300 feet, but are good for practicing piloting or exploring underwater terrain.